Post card image of Reina Mercedes, USS Cumberland (Training Ship #1) and USS Constellation serving as Receiving/Training Ships at Newport, R.I., circa 1905 to 1911. Post card image of USS Constellation moored at her berth in the Inner Harbor at Baltimore, MD., date unknown. Laid down, 25 June 1853 at Gosport Navy Yard, Portsmouth, VA.
CAPT. Dornin, Thomas A. 00 August 1861 - ? COMO Thatcher, Henry K. March 1862 - ? CDR. Hourigan, Patrick William, 29 December 1909 - ? Ghost Soldiers went aboard this fine ship to investigate the possibilty of finding a spirit still within her hull. We were not dissappointed! We had several EMF spikes and were able to identify something near the medical quarters, but it was gone within minutes. This is a piece of history that everyone should visit and enjoy! USS Constellation constructed in 1854 is a sloop-of-war and the second United States Navy ship to carry this famous name. According to the US Naval Registry the original frigate was disassembled on 25 June 1853 in Gosport Navy Yard in Norfolk, Virginia, and the sloop-of-war was constructed in the same yard, possibly with a few recycled materials from the old frigate. USS Constellation is the last sail-only warship designed and built by the U.S. Navy. The sloop was launched on 26 August 1854 and commissioned on 28 July 1855 with Captain Charles H. Bell in command. From 1855-1858 Constellation performed largely diplomatic duties as part of the US Mediterranean Squadron. She was flagship of the US African Squadron from 1859-1861. In this period she disrupted the African slave trade by interdicting three slave ships and releasing the imprisoned Africans. On December 21, 1859, she captured the brig Delicia which was "without colors or papers to show her nationality... completely fitted in all respects for the immediate embarcation [sic] of slaves..."
On September 26, 1860, the Constellation captured the "fast little bark" Cora with 705 slaves, who were set free in Monrovia, Liberia. 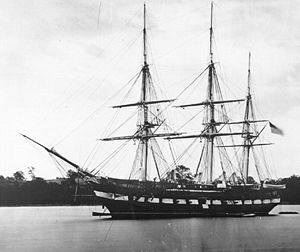 Constellation spent much of the war as a deterrent to Confederate cruisers and commerce raiders in the Mediterranean Sea. After the Civil War Constellation saw various duties such as carrying famine relief stores to Ireland and exhibits to the Paris Exposition Universelle (1878). She also spent a number of years as a receiving ship (floating naval barracks). After being used as a practice ship for Naval Academy midshipmen, Constellation became a training ship in 1894 for the Naval Training Center in Newport, Rhode Island where she helped train more than 60,000 recruits during World War I.
Decommissioned in 1933, Constellation was recommissioned as a national symbol in 1940 by President Franklin Roosevelt. She spent much of the Second World War as relief (i.e. reserve) flagship for the US Altlantic Fleet, but spent the first six months of 1942 as the flagship for Admiral Ernest J. King and Vice Admiral Royal E. Ingersoll. Constellation was again decommissioned on 4 February 1955 and stricken from the Naval Vessel Register on 15 August 1955 — about 100 years and 2 weeks from her first commissioning. She was taken to her permanent berth — Constellation Dock, Inner Harbor at Pier 1, 301 East Pratt Street, Baltimore, Maryland ( 39°17′07.95″N 76°36′40.28″W﻿ / ﻿39.2855417°N 76.6111889°W﻿ / 39.2855417; -76.6111889) — and designated a National Historic Landmark (reference number 66000918) on 23 May 1963 . She is the last existing American Civil War-era naval vessel and was one of the last sail-powered warships built by the U.S. Navy. She has been assigned the hull classification symbol IX-20. In 1994 Constellation was condemned as an unsafe vessel. She was towed to drydock at Fort McHenry in 1996, and a $9-million restoration project was completed in July 1999. On 26 October 2004 Constellation made her first trip out of Baltimore's Inner Harbor since 1955. The trip to the U.S. Naval Academy in Annapolis, lasting six days, marked the ship's first trip to the city in 111 years. Tours are regularly available, self-guided or with the assistance of staff. Nearly all of the ship is accessible, and about half the lines used to rig the vessel are present (amounting to several miles of rope and cordage). A cannon firing is demonstrated daily, and tour groups can also participate in demonstrations such as turning the yards. Some of the funds used to build the sloop were originally allocated to rebuild the frigate. Some timbers from the broken-up frigate were used in the construction of the sloop. The frigate was never formally stricken from the Naval Vessel Register — a wooden, sailing man-of-war called Constellation was continuously listed from 1797-1955. Supporting the position that they are different ships are the facts that the sloop was designed anew from the keel up (without reference to the frigate) and was planned to have been built even if the frigate had not been in the yard during that period. In March 1989 researchers Dana M Wegner and Colan Ratliff from the David Taylor Research Center came upon the builder's hull half model of the Constellation in the U.S. Naval Academy Museum. This was important because half models are only built for new designs, not rebuilds, and the use of half models was introduced after 1797. Besides evaluating the half model the researchers also reviewed all the evidence used in the debate to date, concluding with the help of FBI and BATF forensics that many of the rebuild supporting documents were forgeries. In 1991 they published their findings in a paper titled, Fouled Anchors: The Constellation Question Answered and concluded that they are different ships. The proof advanced in this report was confirmed during the 1999 renovation. At that time evidence was uncovered pointing to the construction of an entirely new sloop-of-war of the 1850s era. Neil Harvey was found guilty for being a coward and a traitor when he was court-martialed after he either left or fell asleep at his station during a battle with a French ship. The sentence was death. Captain Thomas Truxtun ordered him to be executed by being bound in front of a cannon, then shot. His ghost is seen on the orlop, the lowest deck. Ironically, Captain Truxtun is another haunter. His shade regularly appears as an officer wearing a Revolutionary War era Navy uniform on the forecastle deck, the short one at the forward end, above the first full deck. Lieutenant Commander Allen Ross Brougham took a picture of his shade. Truxtun’s ghost is wearing a Revolutionary War era Navy uniform with ruffled shirt, gold striped adorned pants and a cocked hat, holding a sword. Carl Hansen was the Constellation’s watchman until 1965. He loved the ship so much that he did not want to leave. A priest who saw him thought he was a living person. Hansen's ghost was sighted, sitting next to a girl, at a shipboard Hallowe’en party. The first report of ghostly sightings happened in 1955 after the Constellation was docked in Baltimore Harbor. The crew of the USS Pike, (SS-173), a diesel submarine, was moored next to her. The crew saw phantoms walking and gliding on the decks and ghostly lights. Eerie noises emanated from her. A specter of a boy, believed to have been the surgeon’s assistant, has been sighted aboard the Yankee Race Horse. A mournful seaman’s ghost has been spotted hovering around the gun and forecastle decks. Some believe he was so depressed about the frigate’s then condition that he killed himself. Witnesses have seen a sailor running, as if in fear for his life on one of the decks. The odor of gunpowder precedes the sightings of some other ghosts. These entities are the most active at midnight and, usually, between Christmas and New Year’s Day. A still image taken from a video of USS Constellation at Newport, Rhode Island, circa September to November 1900. SUMMARY From Edison films catalog: This picture opens with the young cadets climbing the rigging and going through the sail drill on board the famous historic ship "Constellation." Loosing sail to buntline, making sail, shortening sail and furling; also loose sail to bowline. This picture is absolutely perfect photographically; also very thrilling, and makes a most interesting subject. Original film by Thomas A. Edison; 22 Nov 1900; D22020. REPOSITORY Library of Congress Motion Picture, Broadcasting and Recorded Sound Division Washington, D. C. 20540 USA DIGITAL ID edmp 1729.
overnight investigations cost bigtime, go during the early morning and pay the $15.